Welcome to Garavini Consulting Ltd, business change specialists. We provide business analysis and design solutions with a specific focus on supplying quality deliverables from a suite of techniques. The size and complexity of the project will define the set of techniques utilised and therefore a tailored service is offered to each client for the initial phases of the project. Support is provided throughout the remaining project life cycle phases until the change is implemented and delivered to the Business. How is your existing change management process currently working? 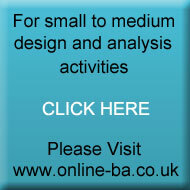 Are the Business reluctant to provide detailed requirements or sign off designs? Do you find that project delivery is hindered by numerous change requests? Do you want your project to run more smoothly with minimal changes and work arounds? Would you benefit from a closer relationship between project teams and the Business? Garavini Consulting has a proven success record with over 10 years experience working for several blue chip clients. Our industry experience and knowledge provides us with the confidence to undertake projects of any size and complexity providing business solutions and ensuring that your project is delivered successfully. For further details on our core skills please visit our Services page. © 2012 Garavini Consulting Limited, All Rights Reserved.